Grab those paddles. Charge 300. Clear! "Ouch!" Now how do you feel? "Great!" Humor can be used as a systematic teaching or assessment tool in your classroom and course Web site. It can shock students to attention and bring deadly, boring course content to life. Since some students have the attention span of goat cheese, we need to find creative online and offline techniques to hook them, engage their emotions, and focus their minds and eyeballs on learning. This book offers numerous techniques on how to effectively use humor in lectures and in-class activities, printed materials, course Web sites and course tests and exams. These techniques can convert any course into an adult version of Sesame Street. "The presentation of background support for humor as an educational tool is also impressive...In fact, in this era of PowerPoint presentations his suggestions of music and graphics as arousing stimuli (complete with internet sources) could be a helpful addition to the right material." "This book could be required reading for any teacher who wants to pick up powerful, evidence-based humor techniques for in-class delivery, course hand-out materials, web sites, distance learning, and even course exams ( to minimize test anxiety and maximize retention). We love Ron's sense of humor that pervades the practical ideas thoughout the book - he truly practices what he teaches. You will learn terrific techniques that are applicable to any instructional level ( even.. and most especially the most "serious" of subjects)." "He continues to inform and amuse readers about how he has used numerous strategies to help students enjoy various courses while learning the contents. The book's eight chapters are presented in two parts that focus on teaching and assessment. Recommended." "Ronald Berk, a recognized authority in measurement and biostatistics, has written two books on the use of humor in teaching and professional presentations. While "humorous biostatistician" is an oxymoron at face value, it is an accurate descriptor for Berk. Both books incorporate his humorous style and are easy and enjoyable to read while also being useful as guides to the use of humor. In writing this review, the temptation is to model, or even parody, Berk's style, trying to out-Berk Berk with witty aphorisms, clever language, double entendre, or other devices. Prudence (perhaps even good taste) suggests a more conservative approach. Professors Are from Mars, originally published in 1998, provides a rationale, evidence, and helpful hints for those who are interested in using humor in their presentations or materials. 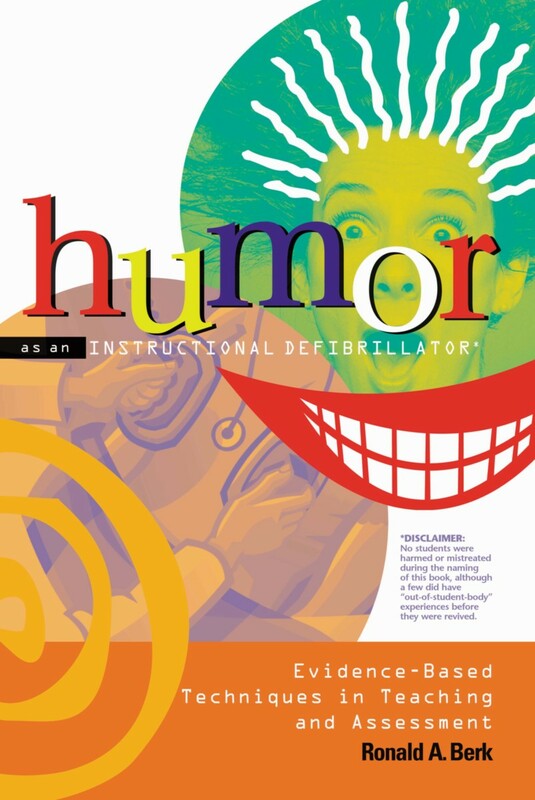 Humor as an Instructional Defibrillator provides much of the same information, but extends the review of scholarship dealing with the effects of humor, provides more examples, and contains a larger treatment of assessment issues, including test item construction. For those interested in simply exploring the use of humor, Professors Are from Mars is probably the better choice. These books are not for everyone. As Berk acknowledges, there will be some who "…have the sense of humor of tile grout…" and who will look upon any attempt to use humor as disrespectful to teaching, the discipline, and all things holy. He rightly cautions that there is some danger, especially for untenured faculty who may have to reply on the opinions of colleagues at promotion and tenure time. Berk also is realistic about the dangers of "bombing" caused by bad material, poor delivery, insensitivity to the audience, etc., especially for those just beginning to incorporate humor into their courses and presentations. Not only does the humor fail, but the teacher risks negative consequences with respect to self-concept, reputation among students and peers, and career aspirations. To help readers avoid such disasters, Berk stresses several useful techniques, including analysis of what makes oneself and one's audience laugh, selecting and adapting material to fit one's situation, testing material in advance, and making constant revisions. To a certain extent, what Berk recommends requires that the reader be willing to exercise some suspension of disbelief. One may read a considerable number of examples without bursting out in uncontrollable laughter, and thus question the extent to which anyone else would find the material funny. Likewise, when attempting to deliver material (and as with any kind of performance), confidence in one's material and ability are important. In effect, if you don't think the material is funny, it won't be, and if you don't think you can deliver it well, you probably won't. There is an old distinction between being a comic and a comedian: one says funny things, the other says things funny. A terse description of Berk's books is that, in the case of classroom humor, the safest advice is to try to do both. Berk's contributions in this are, for all purposes, unique. Anyone interested in incorporating humor into the classroom should refer to these books often. Berk himself notes that he is constantly involved in looking for, creating, or adapting material and that this repertoire changes as a result of context, his audiences, or simply the passage of time. References to a 1960s TV show, for example, may not work with contemporary students, and an academic audience may have little knowledge of the pop culture that provides the basis for much of today's humor. In any case, the lesson to be learned from Berk's books is that humor requires thought, preparation, and consideration of context. Now let me tell you about a funny thing that happened on my way to this book review. This guy came up to me and said he hadn't had a bite in weeks. So I bit him. Alternatively, he said he hadn't had a byte in weeks. So I gave him a chip. Either way, you get Berk's point about the risks." Ronald A. Berk is Professor Emeritus of Biostatistics and Measurement and former Assistant Dean for Teaching, The Johns Hopkins University. He received the University’s Alumni Association Excellence in Teaching Award in 1993 and Caroline Pennington Award for Teaching Excellence in 1997 and was inducted as a Fellow in the Oxford Society of Scholars in 1998.He has published 11 books and 130 journal articles / chapters. These publications reflect his unwavering commitment to mediocrity and his motto: “Go for the Bronze!” He is a popular speaker on teaching and assessment throughout the U.S. and Europe.